£13m+ for Papiss Demba Cisse in January? | NUFC Blog. £13m+ for Papiss Demba Cisse in January? Newcastle United may need to find £13m+ if they want to bring Pappis Demba Cisse to the club in the January transfer window. Having allegedly had a £10m bid for Papiss Demba Cisse rejected in the summer transfer window, it would seem that Newcastle will have to find more than that if they want to bring the striker to St James’ Park in January. Furthermore, we’d find ourselves competing with the Mackems for his signature from Freiburg. “We are all still pretty calm, the boy has been doing a little in-house advertising, that’s legitimate. The asking price is allegedly £13m+, which would be no doubt be considered ‘high’ by Mike Ashley, but I do think we’d be getting the goods with Cisse. He has 87 goals in 197 career first class games and last season he scored 24 goals in 34 games for Freiburg. This season he already has 6 goals in 7 games. Steve Bruce is allegedly after the player too, having missed out on some of his summer targets, and there has also supposedly been interest from Arsenal, Fulham and Bayern Munich. Personally I think Cisse would be a better purchase than our other alleged ‘priority target’ Modibo Maiga, although I will admit I base that on very limited knowledge about both players. The question of need might figure high in Ashley’s mind come January. If Ba and Best are knocking in goals aplenty, Ashley may wonder if we need to spend £13m+ on a new striker, although if goals start drying up then obviously a new striker looks more of a necessity. I’m fairly certain Alan Pardew would like the options a new striker would offer though, regardless of how many goals we score in the interim. Anyway, there’s a lot of football to be played between now and January, so we’ll have to see how things look in the new year. Is Carroll set for a return to the promised land after a year in the wilderness? Toon to get attacking boost amidst defensive woes? Toon interest in 4 strikers and a defender? John Carver reveals more on Newcastle United’s scouting techniques. And we’d still have 22 mill left over… come on Mikey!! I don’t know much about him but I think his playing style quite like our Demba so if Ba can prove himself and score important goal for us until Jan I don’t think we need him. 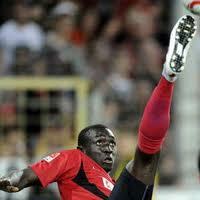 With 13M I think we can do better than Cisse. Pieter, Aly Cissokho or another flash fast forward should be our target. What about the African Cup of Nations? Would we have to wait until that is over? I think Erdinc may be a target again as I can’t see him getting too many games at PSG as they buy even more players in Jan.
How come the PhysioRoom still says 3 weeks for Santon? We certainly need another striker. Best seems lucky, I’m still not convinced, he misses some sitters that a quality striker would bury. Then we’re down to Shola and Lovenkrands again. Will Ashley splash the cash on a decent striker? I don’t think so. He’ll go French and cheap. I’m still not concerned about getting another striker for now. Ba and Best seem to be finding their feet and, should the worst happen with them, I think Lovenkrands would do pretty well, given the midfield we now have. Pieters would appear to be the best buy we could make. LB and cover at CB all in one. has any player in the last 30 years turned us down in favour of the mackems when there was a real choice between the two ie real talks not newspaper specualtion ? come on brucie we love you ” forever a geordie” your doing a great job keep it up, your even getting close to our other secret manager Lawrie Mac. Cisse was 4th choice in the summer transfer window behind Gervinho, Gameiro and Erdinc. Would have been a panic buy as would Maiga and Ruiz. Ba and Best are doing a good job but cover is a bit worrying with Lovens, a loose cannon Ranger and a poor performing Shola. If you are looking for a goals to game ratio then Vossen could be considered. Big lad but likes the ball played in low- doesn’t try to control it ,just hits it first time at the goal. I think our Mr Carr has taken a look at him and I think he would become a Toon favourite. My priority remains in strengthening the defence – if its to be someone we know then lets go back for Pieters. Meanwhile give the attack a chance to claim their places (at least to jan) – I have no problems there. Think we defo need to strengthen at the back, weve made a great start in defence but we need cover in case of injuries, pieters is a good move also need to strengthen up front and personally would love to sign Eden Hazard and pay big money for him, this lads going to be immense in maybe another season. But we do need quality striker and not sure where to go, someone big, strong, fast and young. I’d personally give ranger & £3m to birmingham for ridgewell as defencive cover. Two birds, one stone. I think loven’s contract ends next summer, this shouldn’t be renued but if he plans on retiring then offer him a coaching job, as he’s a nice guy. Don’t care about xisco as he can’t even play in spanish league two side, and his runs out in the summer as well. Ditto with Alan smith. Perch should be sold back to nottingham forest in january when they’ll be desperate for better defenders 1.5m for him me thinks. If it was up to me I’d also get rid of Elliot, as from what I’ve seen of him is terrible, not worth the £300k we payed for him. Al@14…spot on there mate. We need all the players we have at the moment, the young ‘uns will come through, but it’ll take a few years before they are knocking on the first team door..